Editor’s warning: This book review contains spoilers for the first book in the series, Darkship Thieves. If you do not wish for the ending to be spoiled, stop here. Unless you really want to know, in which case, read on. For any protagonist, one’s spouse being shot in the head less than a year after being married is definitely something that makes the reader sit up. When the protagonist is Athena Hera Sinistra, it makes the reader wonder which world will burn first. 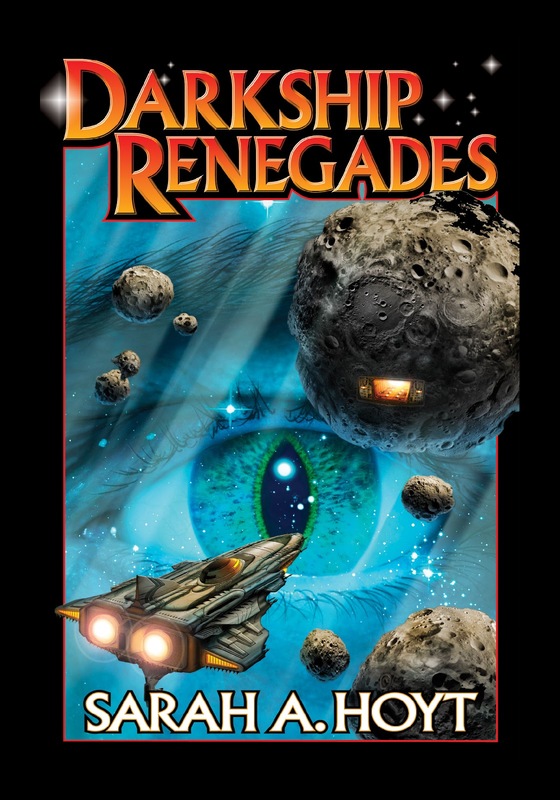 Sarah Hoyt’s latest Darkship novel, Darkship Renegades , picks up immediately after the end of the first book of the series, Darkship Thieves (reviewed here). Athena and Kit, her husband, have just escaped from captivity on Earth after killing her father-clone, the Good Man Sinistra, and triggered an (accidental) beginning of a revolution by releasing prisoners from the undersea fortress of Never Never. Flying their ship back to Eden, they are subsequently detained for being potential spies and collaborators of Earth (something they fought to distinguish against in the first book) once more. The heavy-handed Energy Board committee is beginning to flex their power over the daily life on Eden. Led by a devious man named Casteneda, the Energy Board is tightening the screws of their enemies, which includes Kit and his very extended family. In order to counteract this (and also to prove their loyalty), Athena, Kit, Doc Bartholomeu and the mysterious cat named Zen all volunteer to go to Earth and recover the power tree notes from the brilliant Mule, Jarl Ingemar, Kit’s clone-father, in hopes of recreating the power trees so that Eden would no longer be forced to steal from Earth and risk detection. It’s right about here when Kit is shot in the head and Doc Bartholomeu, in a desperate attempt to save Kit’s life, performs a strange procedure on Kit’s brain to save him. Unfortunately, this also “uploads” the partial consciousness of Kit’s clone-father, Jarl, who is immediately at odds with Kit and Athena over who gets to control Kit’s body and mind. They journey to Earth and struggle to piece together what is Kit’s brain and what is Jarl’s, while Athena is torn between the man she loves and a man who she hates residing in one body. This book is heavier in politics than its predecessor, and also (I think) better written. The pacing isn’t as fast as Darkship Thieves, but the characters are deeper, more complex, and their story is far more fascinating this time around. While in the first book Kit was more playful and almost condescending in his attitude towards Athena, in this one he knows of her strengths and respects them far more. Of course, he (wisely) refrains from a condescending attitude this time, because one does not mock one’s wife without paying a hefty price. Another intriguing facet of the book is Zen. An enigma early on, the reader discovers very quickly why her and Kit are connected and the bond they share. It helps build the potential of a future for Kit and Athena, beyond just their own, but of their potential descendants after them. It also shows a side of Athena (a jealous one) that the reader has yet to really see before. It adds to Athena’s character, I feel. This book is very, very good. Not quite as good as Darkship Thieves, but better written. It’s hard to explain. Some parts of this book meandered whenever Athena’s mind wandered, which is right on target with what could happen when in a first-person narrative. But it also distracts at times, though not negatively, but building upon things that are evident later in the book. It can drive you crazy if you are not patient, but when all the pieces click together at the end, you find yourself smiling, nodding and wondering why you didn’t see that before. A must-have book for the spring reading season, and a dark look at what could happen to even the most noble of causes. This entry was posted on January 22, 2013, 5:20 pm and is filed under Book Review. You can follow any responses to this entry through RSS 2.0. You can leave a response, or trackback from your own site.